Kanafani said that Zionist art gave birth to political Zionism and uses this process to explain the importance of art to create circumstances, events, chronicles, and facts that differ from reality in order to guide events in a specific way. The apartheid wall, which was and is still being built by the Israeli Zionist occupation on Palestinian lands, has created — since its foundation — a place where people protest and refuse Israeli Zionist policies against the Palestinian people in multiple ways, such as using rocks and graffiti. 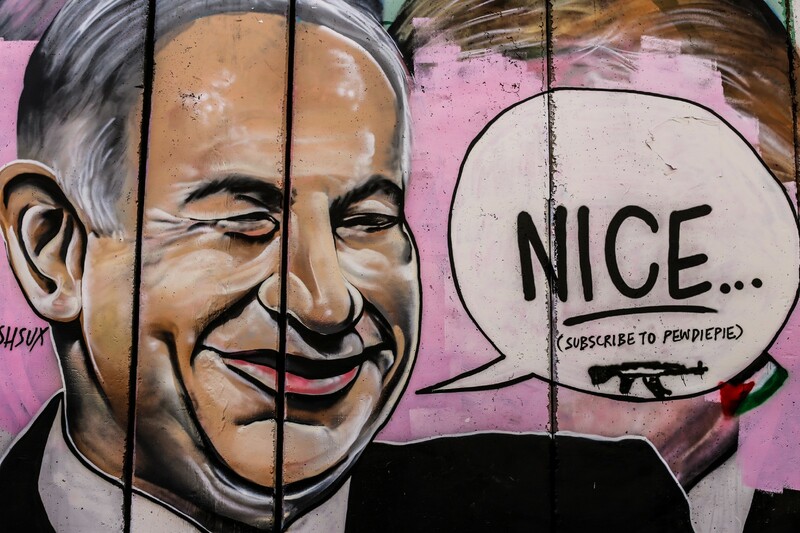 As many others before him, an Australian tourist “Lushsux” began to draw on the apartheid wall, without hesitation, when he realized this wall provided him a large and Free space to work as a graffiti artist. What attracts Lushsux the most is the easiness to use this space to attract attention and gain more followers for him and his art. For this reason, he decided to stay here longer. 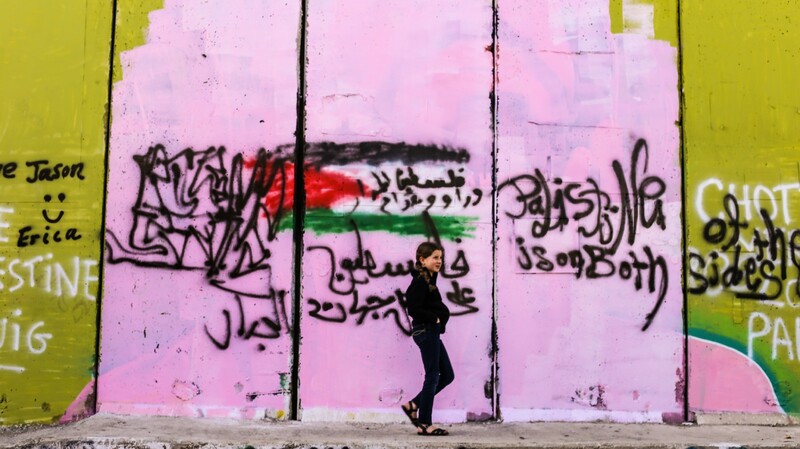 This brings up the first question mark regarding this “Resident Tourist.” Simply, he is using what is considered by a category of people — Palestinians — as a symbol of suffering and oppression — the apartheid wall — for his own benefits, without understanding or feeling what this place means for the people he is using. Many have done the same, and it ended at this place/point, where once the apartheid wall provides the desired “Likes,” it’s time to leave. But Lushsux, the “Resident Tourist”, is selfish and greedy. He gave a vague political shape to his graffiti, which gathered some artists and some local and international followers around him. They began helping him draw more and metastasize. Somehow, he then began to give these artists and followers lectures in How to draw and how to make resistance art! But he forgets that these lectures are given to Palestinians whose culture extends from at least 6,000 B.C. and which resistance and revolution was a huge part of their history. He forgets that he himself, the “Resident Tourist,” is a descendant from one of the more recent colonial movements and ideologies: Australia, an extension of Britain. Here I question: What gives the right to a colonialist to teach me how to fight colonialists!? He, the “Resident Tourist,” didn’t stop there. By looking into his paintings, you will come to see that he is drawing from a specific, subtle, and sinister agenda that is characterized by racism, the alt-right, and fascism. For example, using the quote of Nelson Mandela on a mural depicting Morgan Freeman. If this does not express racism against Black people, than it implies the shallowness of Palestinians. His graffiti of Jewish people is actually racist against Jews. Since there were and are Palestinian Jews, his racism is also against Palestinians. In addition, the Bibi-Trump kiss, in a vague opportunistic way, played with Palestinian emotional senses and presented a political, sinful love affair between Trump and Bibi, to advance his own ideals of how communities should perceive homosexual relationships. There are many other murals by him that also depict these problematic views. 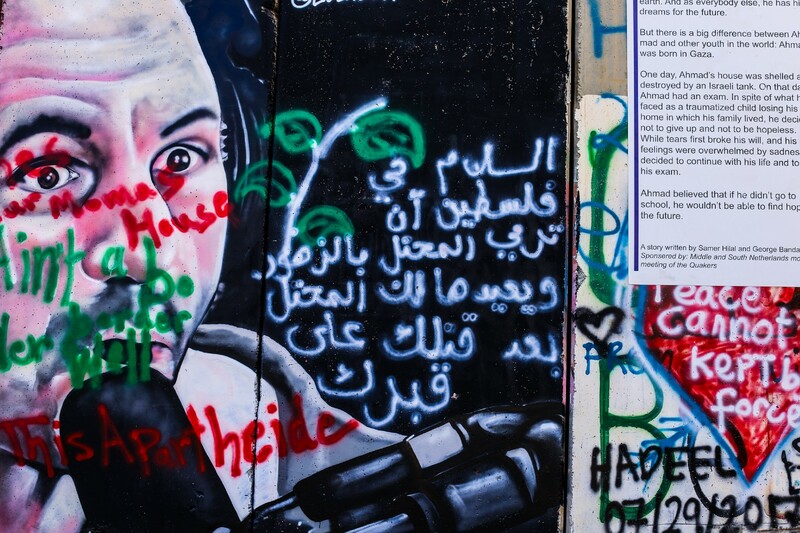 In my opinion, anything on the internal side of the apartheid wall, which is the side that is imprisoning Palestinians, somehow expresses what the Palestinians think, or at the very least what Palestinians accept. Therefore, he is saying that all of us are racist, alt-right, and fascist. Whoever tries to express their opinions over the “Resident Tourist’s” graffiti, Lushsux hurries to accuse them of being an Israeli, or attacking freedom of speech. 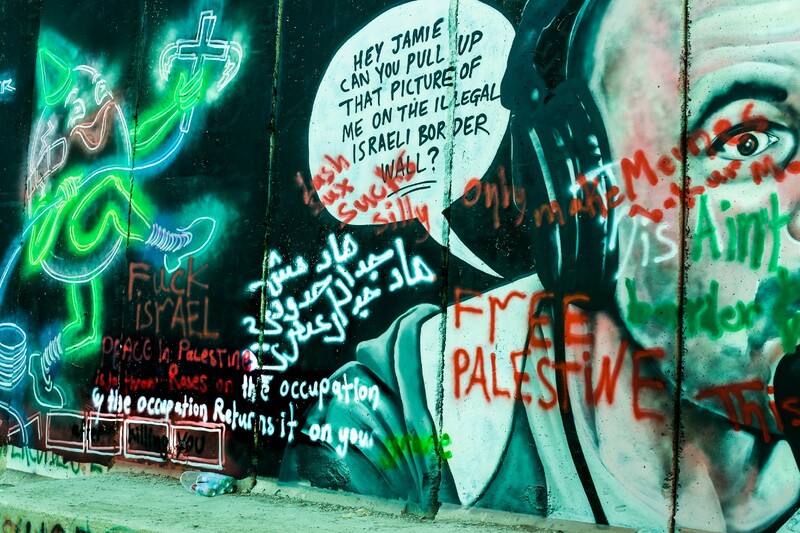 He forgets that his response against his critics is also oppressing freedom of expression, and that his work is actually defacing previous drawings and words on the wall that at one time conveyed what Palestinians wanted to express on the apartheid wall, which he calls a “border wall” — in a way that legitimizes the Israeli Zionist Apartheid wall. For that, we must assure everyone: Here is Palestine, on both sides of the wall. Going back to the studies of Ghassan Kanafani and using them as a tool to understand Lushsux, you are forced into questioning. Is the activities of Lushsux, the “Resident Tourist,” an extension of Zionist art or a development that completes it? Or is he that much oblivious to the realities in Palestine that he cannot see that his art is reminiscent of Zionist art?